As a smaller less powerful rider I have always had to deal with the challenge of being whipped around by the bigger more powerful riders sprinting out of the corners. Over the years I have had to develop ways to be more efficient in criteriums and flat fast races. One way of taking the edge off of the accelerations out of the turns is to scrub speed a little before the corner thereby allowing a small gap to open in front of me. Once I am in the turn I pedal hard in the saddle accelerating through the apex and closing the gap to the rider in front of me. The result is that before the rider in front of me can begin his hard acceleration out of the turn I have already increased my speed to what he will be sprint to. This allows for a smooth transition back into his draft with minimal effort, even while he is accelerating. Alternatively, with mild modification, this technique can be used to attack before a corner. This requires a fair amount of attention and knowing how the pack will take the corner coming up. There is a brief moment of hesitation in the pack as they approach the corner; this is when their attention is focused on setting up the turn and not watching for sneak attacks. Timing is everything, launch too early and you are ahead of the moment of the change in focus and anyone can get on your wheel. Launch too late and you risk the chance of being pinched in the turn and causing a pretty nasty crash.Â Time it just right and you should enter the turn with a 10 to 20 meter gap, but because you are accelerating in the turn you come out of it with an increase in the gap behind you. Riders who are fresh enough to respond are still preoccupied with getting through the turn before they can respond. All the while your speed and lead is increasing. Using these techniques requires a certain level of agility with the bike. The rider needs to be able to move and flow with the bike. Good technique includes engaging the bottom bracket by applying force to the outside foot which is transmitted through the frame to the wheels and tires. This force creates an increase in surface tension between the tires and ground and thereby allows the tires to grip the course gravel of the road better. 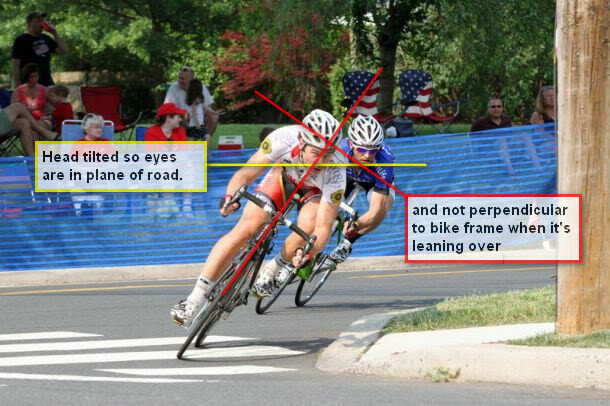 The body should remain centered over the bike keeping your center of gravity over the tires. Lean the bike, not the body. Lastly, the inner hand should be applying force to push the bars away from the body and into the turn. The outside hand should be relaxed and in position for a hard acceleration as you grab for more gear in the straight away. Apply and practice these techniques by yourself and find some level of mastery before attempting in a race. As your confidence increases you will find more places to apply them. Before you know it you will find yourself ripping down a technical road descent and not even feeling like you are pushing your limit. As in all cases, develop little be little and build the envelope slowly.